How much useable blade lenght on the Veritas apron plane? Today was not a good day because I dropped my Lie Nielsen 102 black plane when I slipped on a very slippery area of a teak deck. It now resides on the bottom of the Princess Margriet channel. 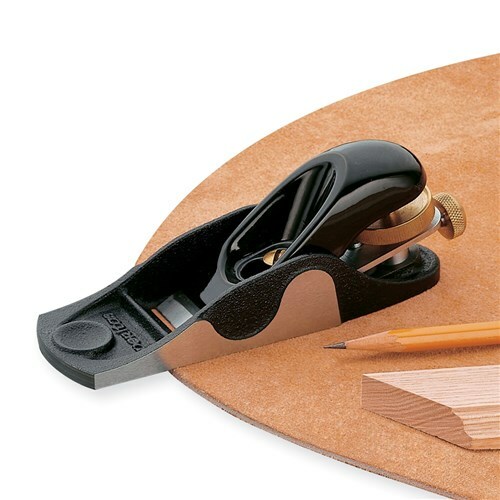 I can't do without a small block plane so I thought I'd try the Veritas apron plane. I do have one question about and maybe one of you has the answer. What is the useable blade length on this plane? The blade itself has only one hole for the adjuster so I'm guessing it's more limited than the Lie Nielsen. Re: How much useable blade lenght on the Veritas apron plane? Are you referring to the DX60 (or its sibling the NX60)? The blade on mine is about 110 mm long, width 35 mm. Considering the length of the fixing hole and the travel of the (Norris type?) adjuster (there are two holes for that in the blade about 9 mm apart), I'd guess about 15 mm could be shaved of before you'd need a new blade. Do you happen to know what the travel on the adjuster is? Edit: After a lot of searching I finally found some information. The useable blade length is 3/8 inch which equates to 9.25mm. There's no way to increase it because the slot in the blade will hit the clamping screw. That's not a whole lot, especially given the price of a Veritas replacement blade so I'm buying a new Lie Nielsen 102.